conditions EVERYTHING I have owned this ski for over a year and it has seen everything. my first review from last year. mounted first at the line with Marker Dukes, unmounted the dukes because the ski is simply to heavy for me to skin with. Open Powder - 8/10 in this size at my skill level this ski is strong performer it is eager to float and for most people would be more than enough ski, but in open powder I do wish I had the more length. It would also make the ski more stompable off airs. Open powder is one of the few times I would rather be skiing my Atomic Thugs with their 192cm of lenght. Close quarters powder - 9.5/10 The ski is hyperquick. Disregard the turning radius its will make any size, shape, at any speed in trees and tight chutes with just small amount of snow. It is one of the best powder tree skis I have tried. wet powder - 7/10 skis pretty good and with the full rocker is always eager to turn but is not as good as say the Rossi S7. Crusted powder - 6/10 ski was slight better mounted on the line, the rossi S7 own this conditions where as the Katana is acceptable but not awesome. Packed powder - 7.5/10 narrow skis like my Blizzard "the one" do better in packed powder conditons, but this ski wont leave you hanging. Tracked powder/ dry crud 9/10 - keeping mind that this skis is slightly short for me out west, perfect lenght back east it flippin rocks and makes cruds its **** The ski is better at crud mounted +2 than at the line. wet heavy crud 10/10 - this ski accels at eating deep heavy sloppy crud, never gets defelcted never feels unstable at stowe. At say snowbird the bigger size would be preferable. ice - 2/10 skis can be flat out scary on true ice. jumping - the skis is a dead sled and does not like to jump. 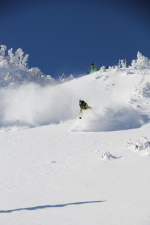 Bottomline - an easy to ski big mountain ski with a biased towards powder, and tight places. This ski has rocked since day one and will stay in my quiver for next year.